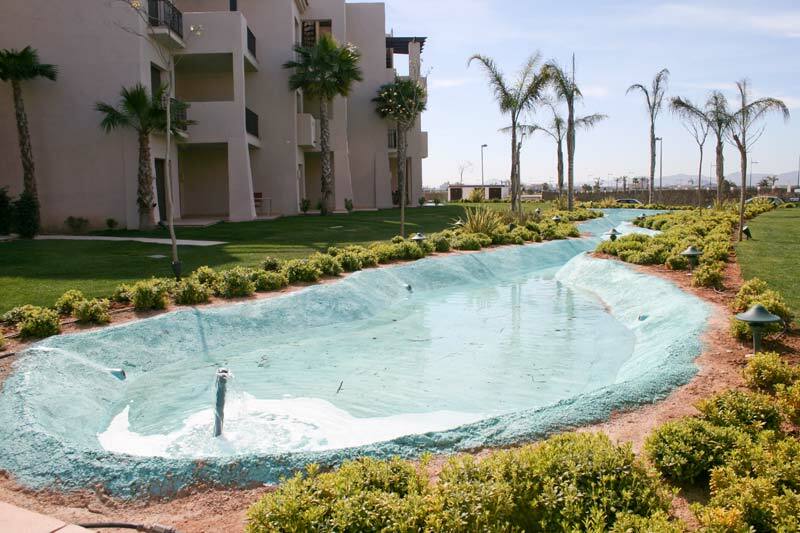 During our last full inspection and photo shoot at Roda Golf and Beach Resort we wanted to pay special attention to the water features in and around phases 1 and 2. There has been lots of negative comments directed at the developer, Calidona, for the poor design and implementation of these water features. We are happy to report that they have all been cleaned out, they have been completely re-painted, and they look really nice, we have included some photos of these. As ever, just click them to make them a lot larger. I think everyone will agree they now look a lot better. The plants are really flourishing on these two phases as well, and everything is getting really "settled in". 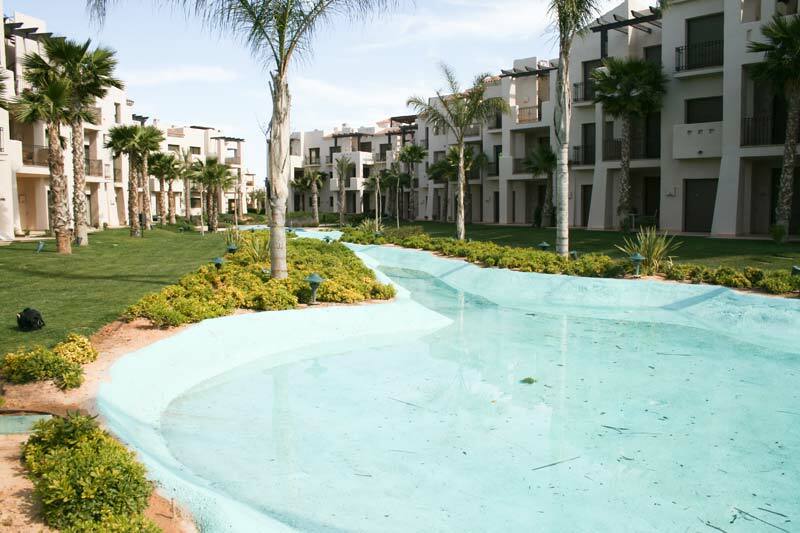 We would like to remind everybody on Roda Golf Phase 1 and 2 that it is no longer the responsibility of the developer, you may know them as Calidona or Roda Golf and Beach Resort, to maintain the water features, the swimming pools or indeed the communal areas. 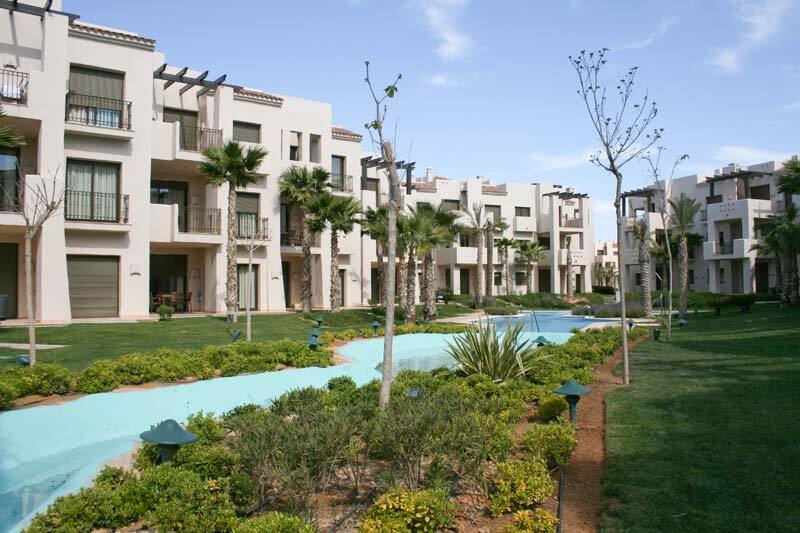 Once each phase, and indeed each section within each phase, has been handed over to the owners, all of the communal areas, etc. are now the responsibility of the community of owners and the administrators appointed for that community, there is little point in "sounding off" at, or about, the developer, as lots of people are doing. 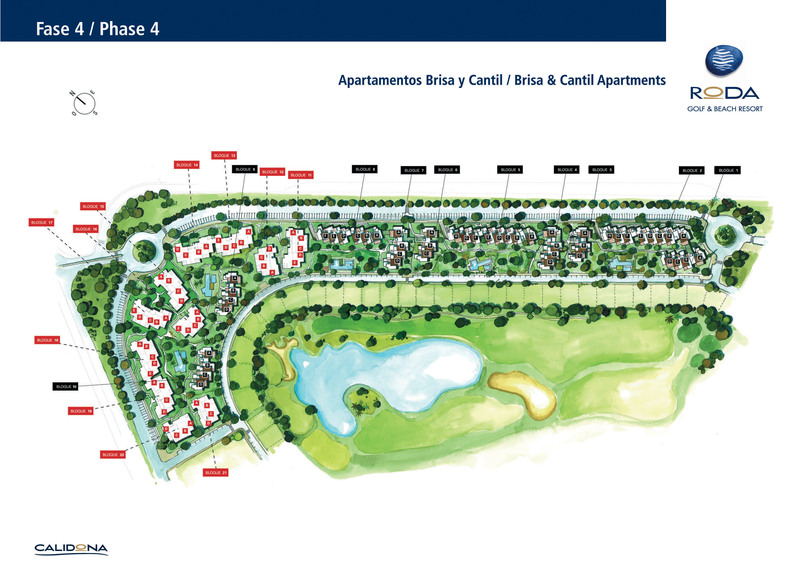 The developer's responsibility has now ended, that is the way it works in Spain and the Roda Golf resort is no exception. The really good news is that it all looks a lot better and long may it continue to do so. If anybody has any concerns about this or any other matter, once they have completed on their property, they should direct all enquiries to their administrator, please feel free to contact us should you experience any difficulties, we will be happy to help if we can. 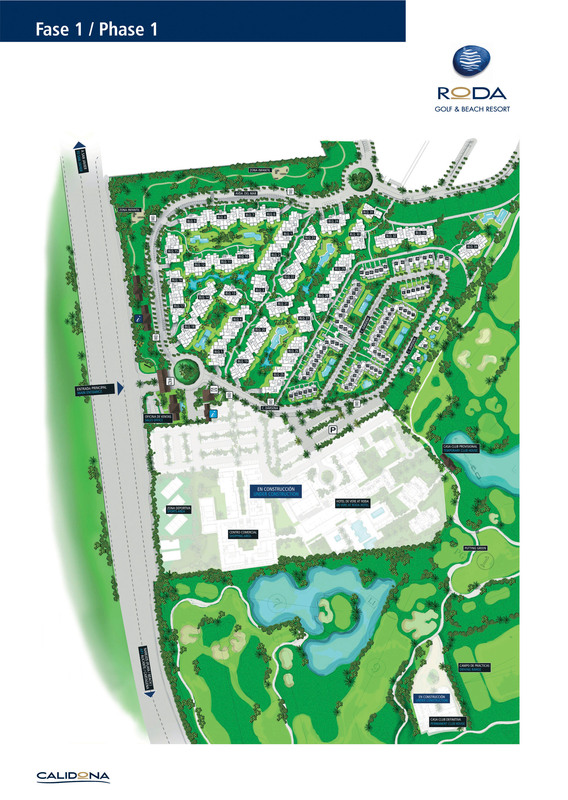 We recently found these very large scale plans depicting the plans for Phases 1-4. Sometimes it's hard to find plans this big and detailed, so we are posting them for the benefit of our readers :) We will also zip them into one file and put them in the "resources" section on the right. 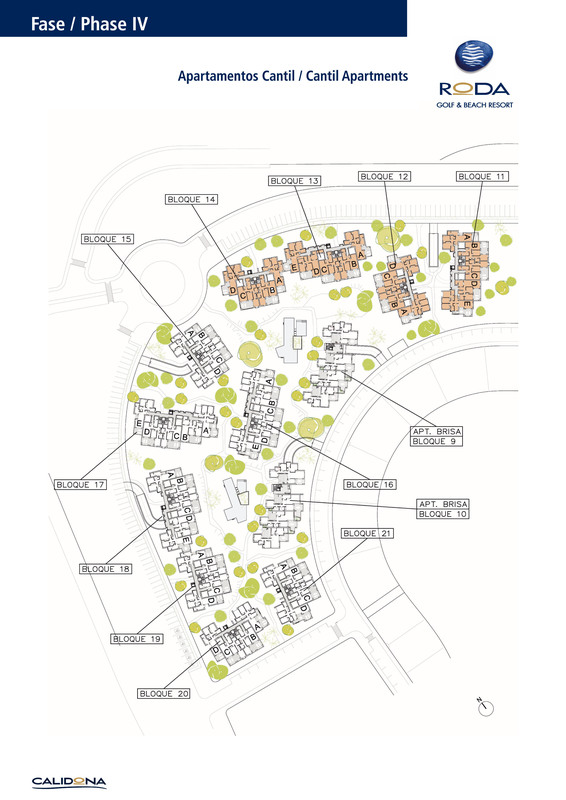 These plans are so detailed you can see every house number...can you see yours?! Full report and gallery from our latest visit on 5th March '08! Here's a gallery of pictures that we took when we were on the site this week. Please just hover over the gallery area to access the controls, and if you click a picture a detailed description will appear! If you want to see any of these images in super large sizes and with detailed descriptions, then please head over to our Flickr page here. Our full report is below the gallery. Happy reading! We visited Roda Golf resort on March 5th 2008, we were very impressed with the resort generally, we are aware that the are delays and that there are snagging issues, also that individual owners have a number of concerns that are unique to them, however for our first report on this new information site, we are going to be informative, positive, honest and generally upbeat, I think that is what most of you would prefer, so here goes. Our first impression of the main entrance, the Roda sign and the general appearance was very positive, very clean looking, very neat and tidy, lot's of people wandering around, plenty of golfers and of course the sales office was busy, which is a good thing, as was the golf course, not a bad start, all in all. Phase 1 looks great, all the plants have really started to mature, the communal gardens and pool area's look just wonderful, we don't think it looks great with the "for sale" or "se vende" signs on the outside of the houses and apartments, the same goes for the "for rent" signs, owners are unlikely to attract any interest from signs on the properties, there are so many websites advertising sales, also so many agents out there, the only people to benefit is free advertising for agency's who probably sold the property in the first place, with the promise of sell before completion, I also think these owners are in breach of community rules, we would advise you check on this. Overall phase 1 is looking great and as we stated earlier, we are aware that there are some outstanding issues, these will be raised in later reports. 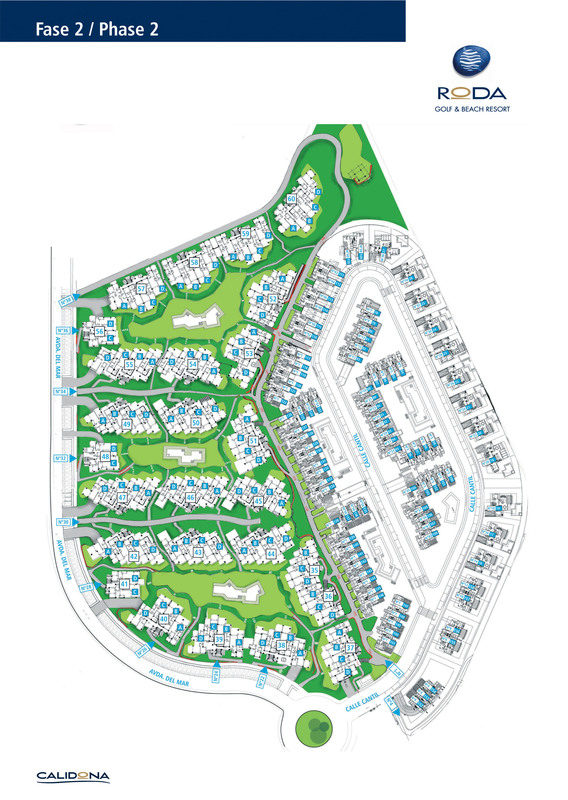 Again, we were very impressed with the progress, most properties have now been handed over and communal area's and swimming pools looked great, by the end of the summer, lot's more green area's and the plants and shrubs will have grown and phase 2 will be beautiful. We took some pictures at the end of phase 2, next to the proposed phase 5 location, there are some great photo's and a panorama shot which we think looks great, the owners over there have some free advertising for their communal area and apartments, should tempt potential renters. Steven Devadics and Kevin Nicholson from Newcastle, both have apartments in this area and they absolutely love them, they are both enjoying rental success and they only completed just before christmas, these 2 characters can regularly be seen playing darts in "Henry's bar" in the 525 plaza. Generally phase 2 is completed, just some remedial work on the gardens and the obligatory snagging, but very impressed. This phase is very exciting, simply because it has taken so long to get to this point, it is very spacious and the whole phase lends itself to outdoors living with lot's of rest and relaxation, which I am quite certain you all deserve very much. We have concentrated on this phase, simply because the other 2 phases have been around for a while and you have all seen the existing batch of updated photo's which regularly find they way on to your own individual websites or the "eye on Spain" site, the difference between this site and the "eye on Spain" site, is that this is purely for Roda Golf owners and their guests, this site is here for you folks to enjoy and have your say! 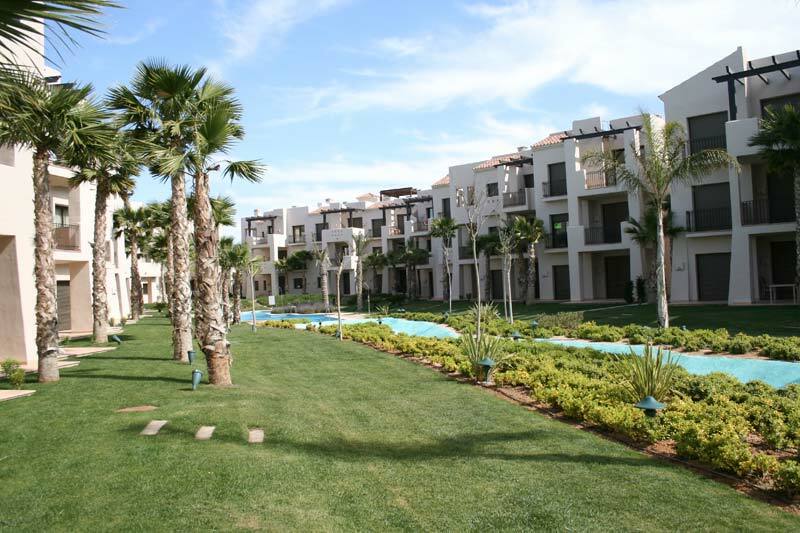 The apartment blocks on phase 3 are very well spaced out with fantastic views of the golf course from most apartments, particularly the first floor and of course the penthouse apartments. Part A of phase 3 is currently being handed over to owners and the ones we have spoken to are very happy, Steve and Nikki Sutton of Bridgend, South Wales were "over the moon" with their first floor apartment, they are due to complete any day, the snagging revealed no real problems and they can not wait to move in, good luck folks, enjoy your new home. There are some unique properties on this phase, the "second line" semi-detached, 3 bedroom "finca" villa's looked fantastic, we really like these properties and the communal area's and walkways between these properties and the apartments were an absolute joy to walk through. There is still some way to go, but after a comprehensive walk through phase 3, part A, we feel that by the end of the summer, this part of the Roda Golf resort will look fantastic, a lot more railings have been used over on phase 3, we have noticed that a lot of you would prefer that, it would appear that the developer is listening to you folks, particularly with the more constructive and balanced suggestions. Overall, phase 3 is going to be superb, looks great, but will be fantastic, phase 3 part B still some way off, possibly by the end of the year, maybe sooner? 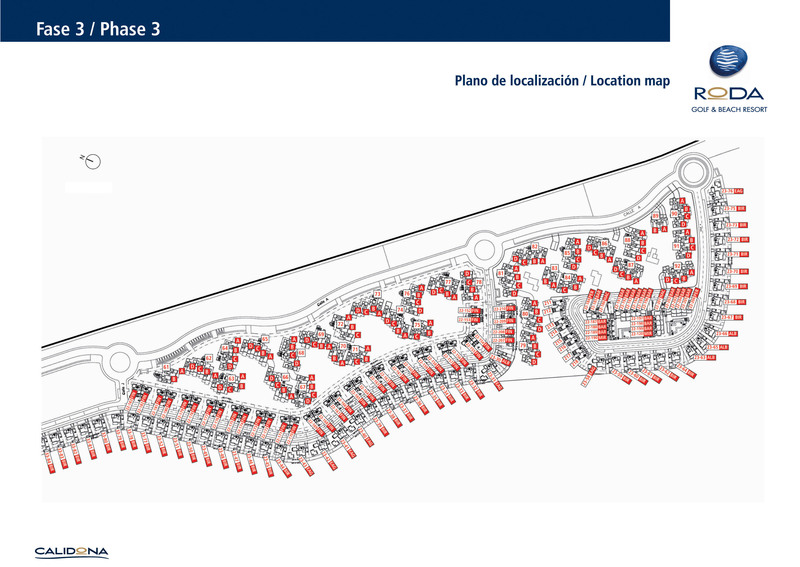 Possible downside of phase 3, furthest away from all amenities, no access across the golf course, get yourselves a golf buggy for travelling around resort, about 3,000 euros for a really nice one. I know a lot of you are very frustrated about the lack of progress over on phase 4, we have taken just one picture here, you can clearly see that considerable work has been started on the villa's, no work on the apartments, building licenses still not in place, however as soon as we hear anything we will post on this site. All the excavatition work has been done for the apartment blocks, all infrastructure is in place, lot's of play area's for the kids, all roads, pavements and walking area's completed, phase 4 will invariably be stunning, be patient folks, stick with it, I know you are getting fed up, it will be superb. The golf course is fantastic, so much harder than we all thought it woiuld be, but still friendly enough for the high handicap golfer, there is a celeb / am event being proposed for Sept / Oct this year, we will keep you informed as we get the final details. When playing the course, you should all respect other players, call players through at all times if you are a bit slow and respect the etiquette at all times, replace all divots and don't forget to repair pitch marks, this is your course remember, also all the very best of luck on the par 3, 7th hole to an island green, the Dave Thomas signature hole is brilliant, but with the wind, it can be a real test and don't forget to have a go for the 18th green in 2, but carry spare balls in case!! We took plenty of pictures here, this is the nicest golf clubhouse I think I have ever seen, the facilities are fantatsic, the views, the furnishings, all top quality and beautifully laid out, when this clubhouse opens, you will all agree it has been worth the wait, the propsed opening for the new De Vere Roda Clubhouse is still March sometime, please watch this space. The new PGA academy is now open, again fantastic facilities, beautiful training bays and the driving range is floodlit, you will enjoy this folks, full prices available on this website and Roda Golf's own site, also full info available in the pro shop. I hope you enjoy reading these comments and observations, whilst we have tried to be impartial and simply be informative, it was difficult not to offer opinions, we think Roda Golf and Beach Resort is fantastic, there are problems, but nothing too major and we believe that this will be one of the nicest golf and beach resorts in Europe. Please feel free to offer any comments, please be gentle with us, we are doing this for your benefit, we are not associated with the developer or De Vere in any way. As soon as we have more information, we will post straight away, you can also help us with any information.